Danny Wilson says Gboly Ariyibi has the power to spark a January bidding war after a Championship move failed to materialise on transfer deadline day. 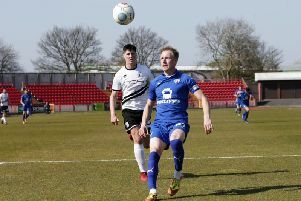 The winger was wanted by at least three Championship clubs but none of them were able to meet Chesterfield owner Dave Allen’s valuation of the player. And although the club have denied that the 21-year-old put in a formal transfer request, Wilson admitted the player might be disappointed with the way things panned out. Addressing the USA U23 international, who is in the final year of his Proact contract, Wilson said: “We said that if the club didn’t feel the valuation was met then he wouldn’t go anywhere. “The owner has been brilliant in that respect. He feels that people are trying to pinch him. “It gives us another three months or so to the next window and he can concentrate soley on playing. “I feel like that would have been the right decision anyway had Gboly had to make the decision himself. But it was taken out of his hands. In Wilson’s eyes, Ariyibi’s challenge is to put any disappointment behind him and make himself an even more attractive proposition to bigger clubs in the January transfer window. The manager said: “He’s seen potential moves scuppered but we’ve seen it with players before. “If you throw the dummy out and don’t want to play, which I’m not suggesting Gboly will do, there’ll not be many come in for you in January. “What’s the point in sulking? I’d be quite bouyed if that many clubs came in for me so the bottom line is if he can play as well as we know he can play between now and January, there could be another 10 suitors waiting. “So the challenge is down to himself now, he’ll be slightly disappointed but with a great deal to look forward to. Retaining the pacey wide player is obviously a boost for Wilson’s plans in League One, but he feels the club’s resolve will impress the supporters, even if it’s a financial gamble given Ariyibi’s contract situation and apparent desire to leave. “In the coming months the value will either increase or go to tribunal and you get compensation for him anyway. That’s the decision the club has made,” said Wilson. “I’m very happy, as a manager you want to keep your best players. “From the fans’ point of view I think it’s fantastic. Wilson was on tenterhooks late last night, fearing a last minute bid that could prise Ariyibi away and revealed his belief that the player was being told to make a move happen. “There was a lot of pressure on Gboly from different areas to get himself away, which I don’t think at times was the best advice he could have had,” he said.